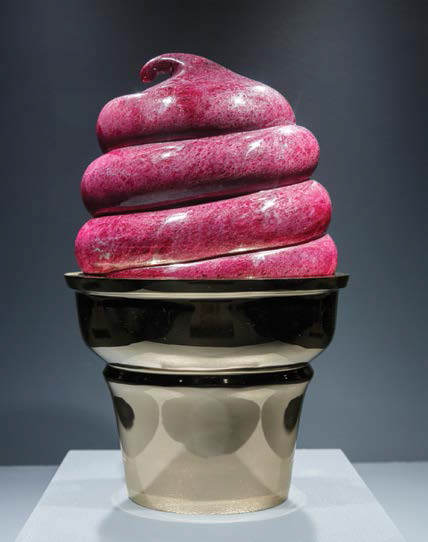 Photo courtesy of contemporaryartscenter.org | Mark Motherbaugh’s “Ruby Kusturd” is one of the pieces on display at the CAC, where Xavier students will show their work. The Contemporary Arts Center (CAC) in Cincinnati is a prestigious location for aspiring local artists to show their talent. This December, the Xavier Art Society will host an exhibit at the CAC, showcasing the creative talent the arts department has to offer. The CAC’s upcoming display is titled “Myopia,” which means nearsightedness. The idea was created by DEVO guitarist Mark Mothersbaugh, an artist even before the 80’s new wave band came together. As one might guess, Mothersbaugh suffered from severe nearsightedness as a child until prescribed glasses at the age of seven. Mothersbaugh recalls that he was unaware of his eye problems and began his exhibit in response to those seven years. Mothersbaugh’s recovered vision allowed him to tap into his artistic prowess following his treatment. Alongside his musical career, Mothersbaugh created art as a reflection on current events at the time, such as the Kent State shootings. In addition to that, the DEVO frontman has produced works expressing social and gender issues, explaining some of his works as a rejection of the patriarchy. Smith and Sager described their plans for the next month, working on technicolor and plexiglass projects to convey current events and issues in gender. The “Myopia” showcase will take place at the CAC from Dec. 7-11. The Xavier Art Society will set up on Dec. 6, and the opening reception will take place from 6-9 p.m. on Dec. 10. For other art department viewings, be on the lookout for the Rome Experience Art exhibition in November at Cohen Center.